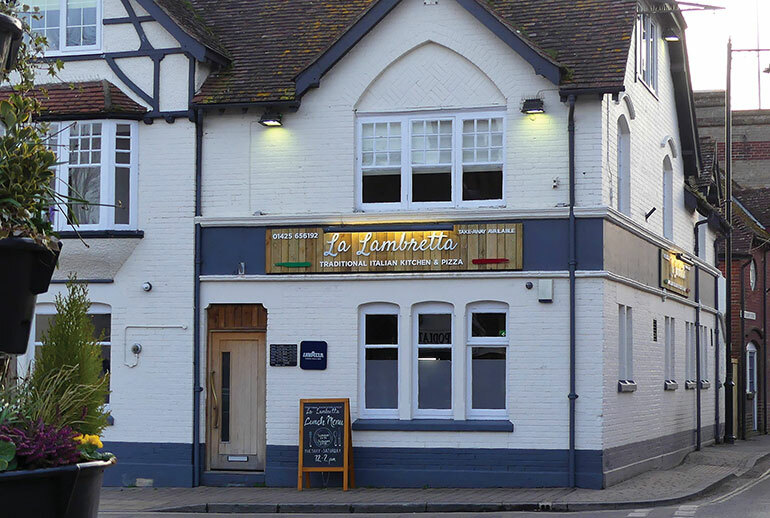 La Lambretta in Fordingbridge is a really impressive, and authentic Italian restaurant, with an interior of rustic brickwork, wooden floors and immaculate white linen. It is owned and run by Marco Stefanini. Marco hails from Piedmont in north-west Italy and comes from a restaurantowning family. So from an early age, he was helping in the restaurant kitchen. However, with a love of, and talent for skiing, Marco became a ski instructor in his local mountainscape before marrying his English wife and relocating to England with their children a few years later. Once established in the area, Marco was soon employed as manager of the Radnor Arms, before searching for his own perfect premises for a restaurant. In October the dream became a reality. “Our menu is traditional Italian, not English-Italian, so reflects how Italians like to eat,” said Marco enthusiastically as he welcomed us in. We were offered a drink there on our arrival, and Paul, my husband, chose a small carafe of white Sicilian wine and I decided on a small glass of organic Sicilian red. There are predominantly Italian wines on the drinks menu, with a few others. 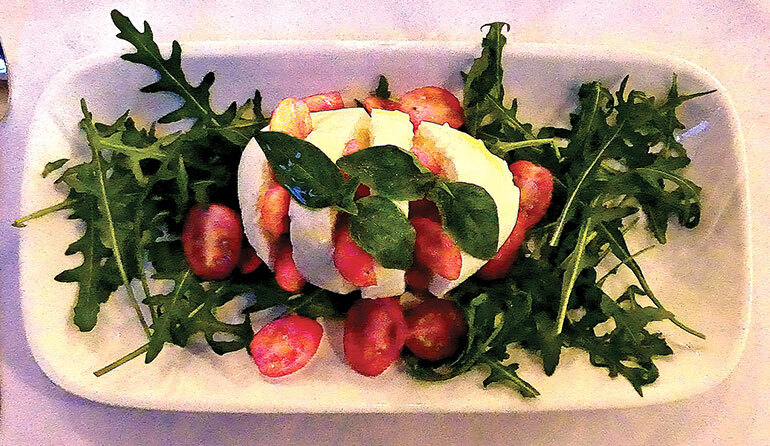 But we decided, ‘when in Rome…’ It certainly felt like we had taken a trip to Rome with a warm, continental atmosphere, Italian staff and a relaxed ambience. The weather outside was a cold English evening in March, but we soon forgot that. Our own menu was the winter one, but it is about to change to a lighter, spring version, which will include more fish dishes and salads. While we waited for our chosen dishes, we were given canapi farinata – which are little chickpea flour canapés. 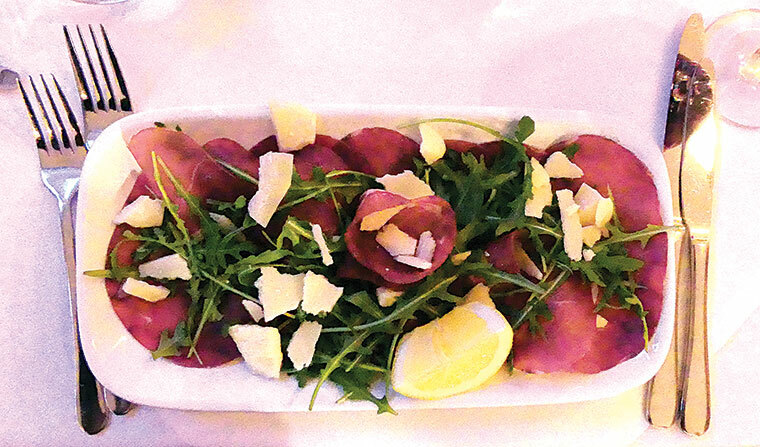 For our starters, Paul had selected the fresh buffalo mozzarella, cherry tomatoes and rocket, while I requested the Bresaola – air-dried salt beef, rocket and Grana Pedano cheese shavings. We swapped the delicious dishes half way through. They were accompanied by a basket of Italian breadsticks and some special wafer-thin Sardinian Carasau (musicpaper) bread which is very crispy, and like a cross between a poppadum and a flatbread. Paul chose pasta for his main course and was delighted to see the fresh tagliatelle with porcini mushrooms brought to the table. 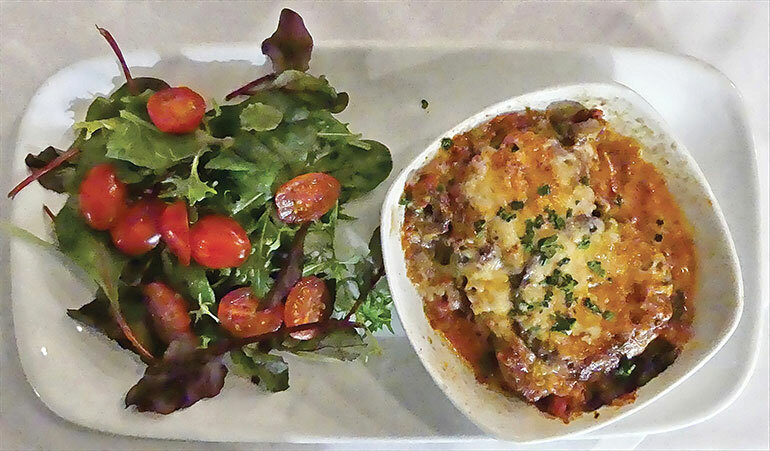 I had selected the baked aubergine, mozzarella and tomato dish called Involtini di Melanzana, infused with garlic and served with salad. We’d just enough room for two desserts; the decadent homemade Tiramisu (one of Mr W’s favourites) while I opted for the lemon sorbet, but this was no ordinary sorbet. Served with Limoncello and Prosecco, it was fabulous. I rounded off with an authentic Italian coffee, while Paul finished his wine. It was a veritable feast of a meal and we loved our visit. All the members of staff were lovely, while Marco was an excellent host. If you would like to visit, La Lambretta is open Tuesday to Saturday lunchtimes 12-2pm and Monday to Saturday evenings 6-9.30pm. It is closed on Sundays, which is a family day for Marco and the other staff.